I'm a girl who likes to snack. I know that some people who strictly track their macros or follow a diet plan like to plan larger meals to enjoy and thus don't snack much between meals to save room for a larger meal. That is NOT me. If I don't snack, especially in the afternoon while at work, I get HANGRY. Thus, I was really excited to try out the Love with Food subscription service because I'm always looking for new, healthy snacks to munch on. 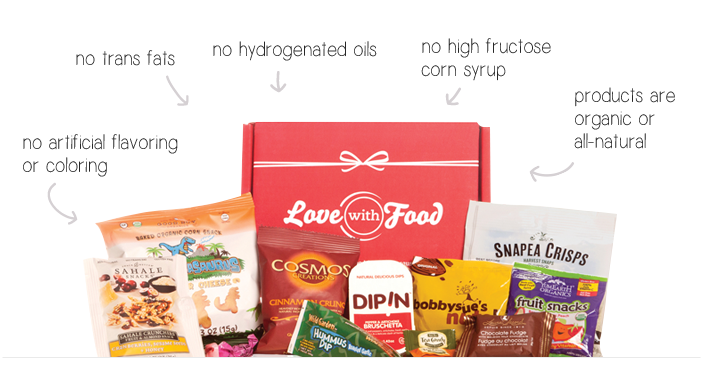 Love with Food is a subscription service that ships you a box full of all-natural, organic or gluten free snacks each month. Plans start as low as $7.99/month to be shipped a box full of fun goodies to try! It's such a fun way to be able to discover new snacks with an ease of mind knowing that everything in the box will be made with quality ingredients. I got to try out the Deluxe and Gluten Free boxes and I discovered a ton of yummy new snacks!! I had these Beanitos backed mac and cheese flavored crisps for an afternoon snack this week and oh my gosh. SO FREAKING GOOD. They tasted even better than a bag of Cheetos and are so much more for healthy for you! I got two of these Luna protein bars and I'm so glad I did because I ate one with my breakfast today and I'm already excited to eat the other one tomorrow because that's how yummy it was. There were also a bunch of fun random extra items: a chocolate snack that has as much caffeine as a cup of coffee?? Yeah, that came SUPER in handy Monday AM when the weekend was over way too fast! I love the variety in the box, there were so many things thrown in there that I normally wouldn't pick up off a shelf but really enjoyed trying. Personally though I think that the best thing about Love with Food is that for every box sold they donate at least one meal to a food shelter. Tasty snacks, affordable pricing plans, and they give back to the community. Win-win in my book! If you want to try Love with Food for yourself, you can check out their different plans available online. Click over from my blog and get 40% off your first box! The cakes look delicious and attractive.